Long ago in a time of far away, dreams of places worth caring about were established. Quietly at first, because the very thought of change meant moving to distant shores away from those they loved - never again to see them. Many of the women who had prepared for this eventuality were stalwart in frame and dignity, deeply devoted to the men who shared their lives. Moving on foot, on horseback and through the swamps of yesteryear's mire, they traveled. Daily faced by fears and determined order, they proceeded. I remember being just eighteen, and going to places unknown. The first time ever away from home, I boarded the Texas Eagle - a silver train that thundered very quickly in and out of the Rochester train station, where I boarded it with my heart reflecting the challenge which went before me. It was three years before I saw my family home again. Times were different then. The year 1953. Time - the more it moves forward, the more it remains the same. Guaranteed that it will go on - at some level of recreative source, we plan for February, and beyond. Those who have walked before us did the same despite hardships and loss of valued connections. In a new book out called "Women's Letters - America from the Revolutionary War to the Present" - I have been reading some of the passionate and sometimes mundane, every day letters that were chronicled and at some level, put together for all of us to enjoy. What a precious commodity that is. I am wondering how many letters we have available to us in this community which would tell our story from the inside out? I have heard of "Sarah Carpenter's Diary," an every day journal of tiny little memories that made a difference in her life's purpose. She lived in Macedon in the 1800's. Denie Johnston meticulously copied this diary and we are privileged to still have a copy of it in the Nettie Bullis Room of our local Macedon Public Library despite the terrible fire that touched our community just a few years ago. In this day of computerized technology, wouldn't our ancestors not only be amazed - but some would be afraid of the "miracles" they would see. On the 1st of February, 1894 twenty-five original members of The Macedon Historical Society had the foresight to think creatively, establishing the need for a secure place to save our historical treasures. With all good intentions, they moved forward. Today the Society still radiates these possibilities, moving forward with new and more extensive ways to celebrate our history. Sally Millick, our Village Historian, in her valiant attempt to rediscover some of the wonderful treasures which are stored in the Macedon Academy Museum, found the first original minutes of the Town of Macedon. Many good things came from this, and one of them - in a personal way, was the fact that three of my relatives' signatures were in these Minutes. I had always wondered why I actually cared about all of this, and as time presented - I certainly found out why. Today the Society still radiates these possibilities, moving forward with new and more extensive ways to celebrate our history. They could always use more interested and interesting members, and I am sure that Sally would be more than pleased to hear from any who would like to share in this group effort to make a difference. Somewhere in my own ancestral memory's storehouse all of the above radiates in and through me. There is a genuine need to continue this celebration. When I see pictures of the horse-drawn sleighs, I can still feel the cold wind on my cheeks, see the frozen breath of all who are sharing the ride, and hear the jingling of the sleigh bells. A place which celebrates all of these conditional promises is in the offing, and I am sure that many of you realize how very important this is to the historical destiny of our local area. The 1816 Farmington-Macedon Museum will be moved to its new grounds in June of this year. We are celebrating all of these steps in time, despite the multiple hurdles we have had to jump to continue this fantastic voyage of the rediscovery of our fabulous nationally important history. At some level, we reflected the power of a universal connection, and every day we are rediscovering why. As one of the Trustees on this exciting project, I have seen firsthand, the possibilities and the down/right hard work that has gone into it. A steering committee meets every month, and new participants are always welcome to attend and find your place on this journey of light-filled possibilities. Last Saturday Mark DeCracker presented a most interesting heritage program at Books, ETC. Our local authorities need to be more aware of the importance of including monies to support the factoring of these possibilities. Macedon's eastern doorway now reflects the beauty of a mural - our very own mural, depicting the history of this area. The colors are bright. The message is clear. 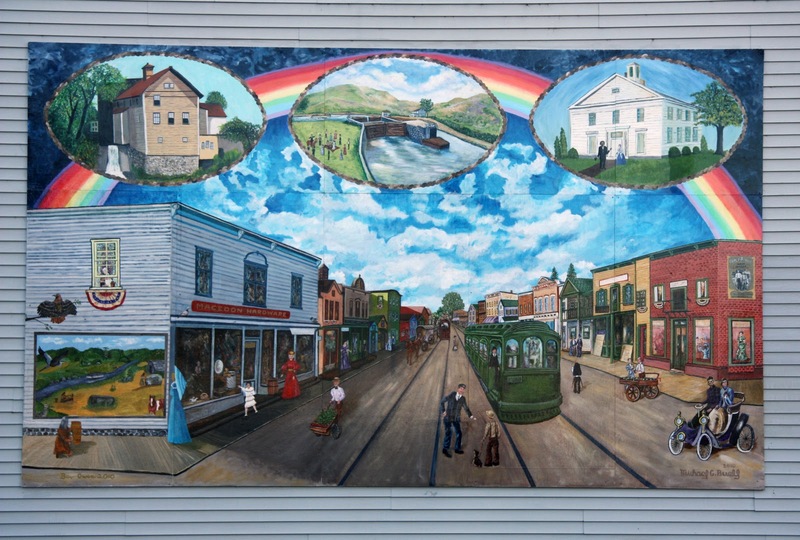 The basic building blocks of any community are reflected in their historical connections, and what a fascinating journey it has been in any given place. I read that Macedon's first Town Meeting was held at the home of Lydia Porter, and now we have the very first minutes which were taken there. Wow! I am wondering if she just served cake and coffee or participated in the decisions made - or both? The year was 1823. HAPPY VALENTINE'S DAY, and if the sun shines on the 2nd of February, look over your shoulder and you may see a sprightly groundhog smiling at you. With a gleam in his eye and a shimmyshake from a long winter's hibernation he might say to you, "We're on the way to spring. Take heart!" Have a great month of making good plans for the future, and may I suggest that you not only talk the talk of the importance of history in our combined communities, but also support your local history projects in any way that you can so that we, too can leave a valid mark of prosperity's gain in every place where we have all left our footprints in time. Please continue to value the commitment of these local projects by supporting them in voice, monies and attention to detail because each and every one of you have a story to tell. If you do not put forth the effort to share them, then they will be quickly lost in time. What an exciting time to commit to these possibilities!! We are listening for your voice. 3 Comments to "HOMESPUN - Chapter Six"
Your article was not only enjoyable but oh so interesting! How fortunate Homespun is to have your beautiful gift of writing for their readers to look forward to. My, what joy! Your writing helps to consolidate all the different ways we want to move. Thank you for this help and love. As I read I see we are working hard and our efforts will take on their own destiny--only patience and perseverance are needed. I love you. John C.
You all are to be commended for all the effort you are bringing to bear on preserving the past. On a trip to Gettysburg recently I was touched by the fore thought the local people had to preserve that area. In the midst of the battle etc. We are blessed by those with vision.